Smartex is an engineered solution to help textile manufacturers improve production yields, by reducing defective production to nearly 0%, by providing quality inspection and monitoring software, suitable for Business Intelligence analysis. The system is a non-intrusive product, designed to be easily plugged into Circular Knitting Machines. Using signal acquisition devices, sensors, and processing units, Smartex system detects production faults in the output fabric, in real-time and in-line with production, alerting workers and stopping production if the fault is cyclic. Smartex provides manufacturers as well with a quality monitoring software, that overviews all knitting machines where Smartex is installed, extracting all available data from the machine, providing production statistics and helpful insights. Smartex is participating in HAX, the world's largest hardware startup accelerator! 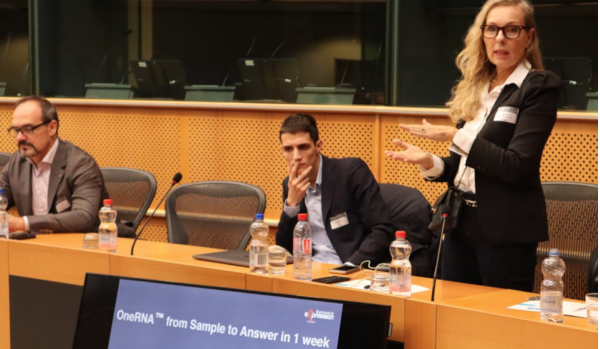 Smartex was invited to pitch in the European Parliament ! Copyright 2019 Smartex. All Rights Reserved.